Eastern senior Madison Williams hits a stop-and-pop jumper over a trio of Lady Rebels, during the first half of the Lady Eagles’ 60-24 victory on Monday in Tuppers Plains, Ohio. South Gallia senior Erin Evans (11) shoots a layup past Eastern senior Madison Williams (12) during the Lady Rebels’ setback on Monday in Tuppers Plains, Ohio. TUPPERS PLAINS, Ohio — Wire-to-wire. 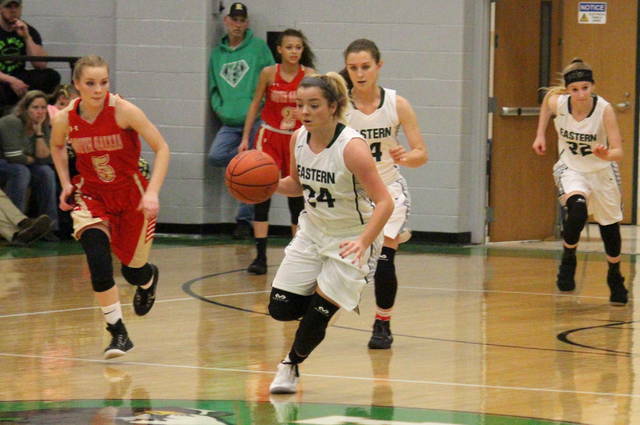 The Eastern girls basketball team took the lead eight seconds into Monday’s Tri-Valley Conference Hocking Division showdown in Meigs County, and the Lady Eagles never looked back on their way to a 60-24 victory over visiting South Gallia. 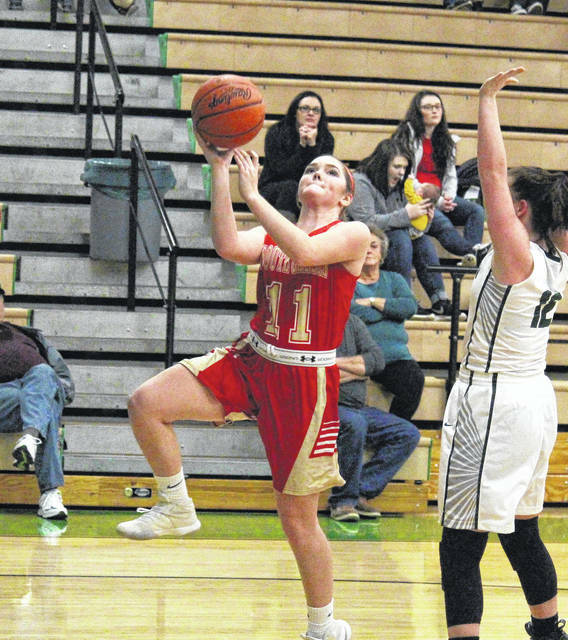 Eastern (1-1, 1-0 TVC Hocking) scored the game’s first six points in 1:32, but South Gallia (0-2, 0-1) played the Lady Eagles evenly over the next 4:20, with each team scoring seven points. The hosts closed the opening stanza on a 9-0 run, making their advantage 22-7 eight minutes into play. Both defenses stepped up in the second quarter, with Eastern outscoring its guest by a 7-6 clip, making the halftime margin 29-13. The Lady Eagles continued to build their advantage throughout the second half, leading 47-20 at the end of the third and 60-24 by the time the final buzzer sounded, with the 36-point final margin as the hosts’ largest lead of the night. For the game, Eastern made 25-of-63 (39.7 percent) field goal attempts, including 2-of-14 (11.8 percent) three-point tries. Meanwhile, South Gallia shot 8-of-43 (18.6 percent) from the field, including just 1-of-11 (9.1 percent) from deep. At the free throw line, EHS was 8-of-13 (61.5 percent) and SGHS was 7-of-14 (50 percent). The Green, White and Gold won the rebounding battle by a 37-to-29 clip, including 16-to-9 on the offensive glass. As a team, Eastern marked 21 assists, 15 steals and three blocked shots, while turning the ball over 16 times. The Lady Rebels combined for five assists and eight steals, while giving the ball away 28 times. The Lady Eagles were led by senior Elizabeth Collins, who had a double-double effort of 15 points and 10 rebounds, to go with a game-high three rejections. 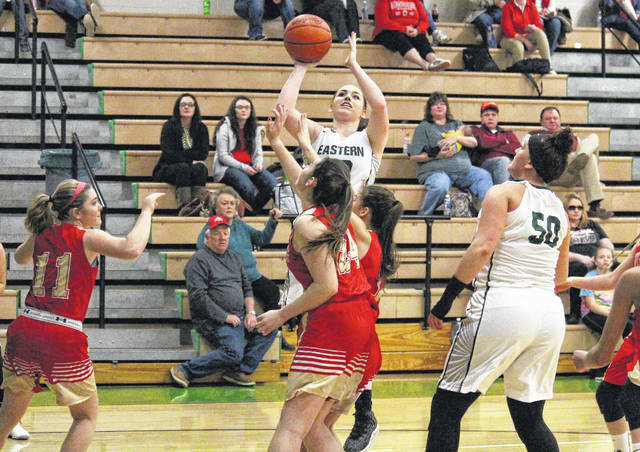 EHS senior Madison Williams was next with 14 points and eight rebounds, while Jess Parker and Alyson Bailey both scored eight points, with Parker dishing out a team-best six assists and Bailey recording a game-high seven steals. 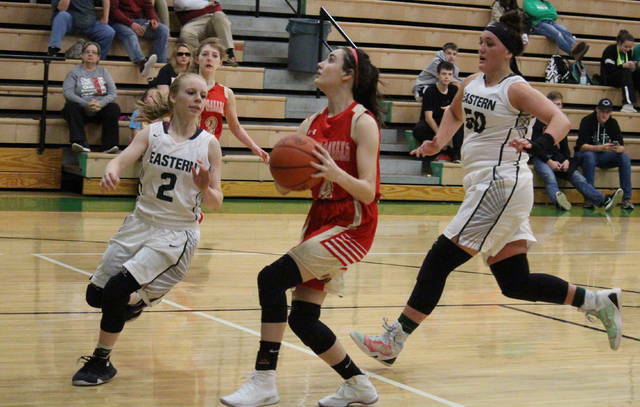 EHS senior Kaitlyn Hawk contributed seven points and eight rebounds to the winning cause, while Kelsey Casto and Kassie Casto chipped in with four points apiece. Amaya Howell led the SGHS offense with six points, followed by Olivia Hornsby with five points and five rebounds. Aaliyah Howell and Makayla Waugh both scored three points in the setback, Erin Evans, Alyssa Cremeens and Kylie Stapleton added two apiece, while Faith Poling finished with one marker. Although she didn’t mark in the scoring column, SGHS sophomore Christine Griffith certainly made an impact, recording team-highs of nine rebounds, two assists and four steals. The Lady Rebels will have a chance to avenge this setback on Jan. 18 in Mercerville. Both teams continue TVC Hocking play on Thursday, with the Lady Eagles visiting Trimble, and the Lady Rebels hosting Miller.